I played for a while this evening with WSPR using my K3 on 40 Meters at the 500 milliwatt, then at 100 milliwatts, the lowest K3 power output setting. It fed a ZS6BKW (modified G5RV) antenna with its center around 30 feet above ground. After seeing so many stations reporting hearing the K1HTV signal, I thought it would be fun to insert the step attenuator in the coax line to see what very low power levels could be copied. Transmitting for 3 hours at the 50 milliwatt level I received reports from 28 stations, the farthest distance being 3775 km. 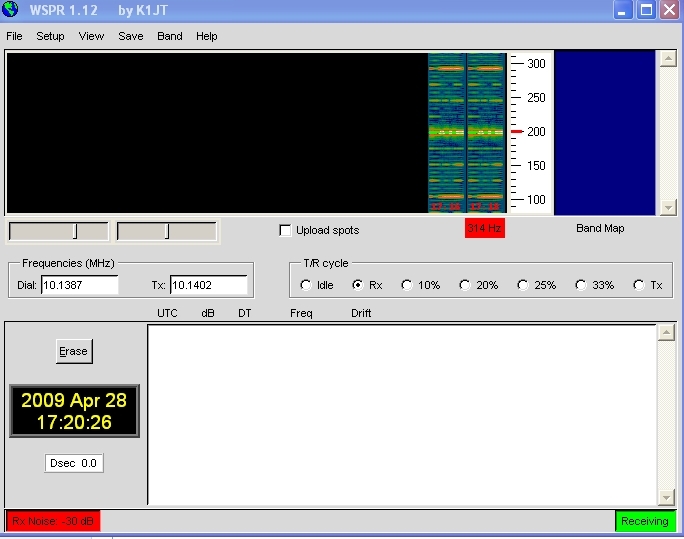 Transmitting for about an hour at 10 milliwatts output, 9 different stations copied the signal. The farthest distance was 1209 km. The 5 milliwatt power level was only tried for 10 minutes. The stations with the golden ears that copied that 5mw signal were W1BW (970 km) and AA0N (1209 km). Will have to try that and lower levels in future tests. If you are able to reduce your power to QRPP levels, I encourage to try WSPR at power levels in the milliwatt range. The URL below describes how to build a 10db attenuator to drop, for example, 5 Watts output down to 0.5 Watts (500 milliwatts).